Creationists may call us compromised and effectively question our salvation, but they may be surprised to know that know that we Christian evolutionists actually take the Bible very seriously indeed. In fact, it’s precisely because we believe in it that we take science seriously and are evolutionists. A particularly striking example of a time-bound insight that we have now abandoned may be found in the idea of a separation of the waters of the primal flood by a firmament (Gen. 1:6f.). This firmament explains mechanically why the waters beneath it, which cover the earth retreat and gather together and thus let dry ground emerge, for no masses of water an now pour down upon them through the heavenly “bell” or vault (1:6, 9f.). The story of the flood tells us what happens when leaks in the vault occur and are not stopped (7:11). 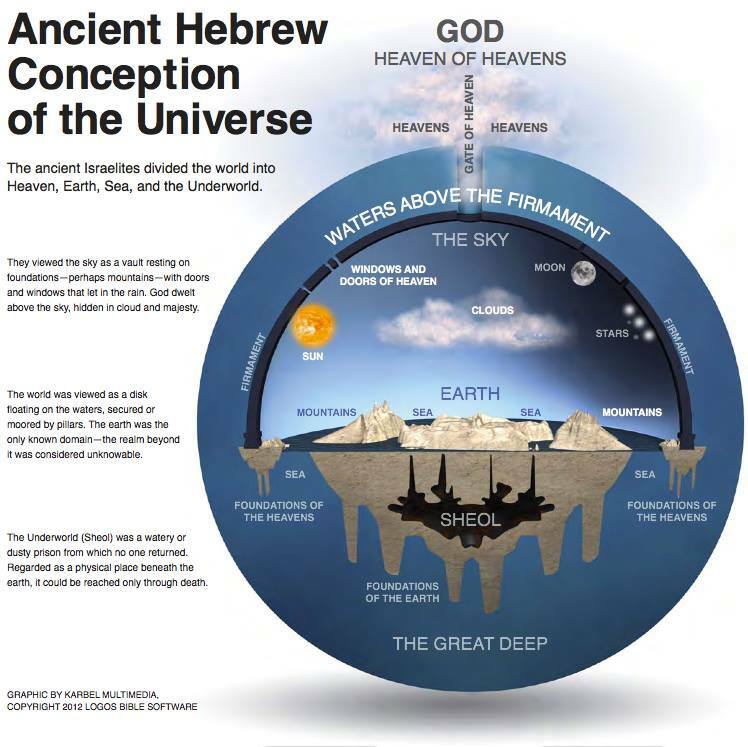 A central element of the narrative of the primordial history (Genesis 1-11) is the firmament. As you can see from the graphic above, the firmament was a kind of vault, way up in the sky with the sun, moon and stars stuck to it, that held back the waters. When it rained, “the floodgates of the heavens were opened”, as Genesis 7:11 says. 2500 years later, we know that the cosmology of Genesis was wrong. There’s no firmament above us, but rather immeasurable distances of outer space. But Pannenberg’s point is that as far as the Hebrew authors of Genesis knew, there was a firmament. And that’s not an unreasonable conclusion. Just like the roof over your head holds back the rain, so there must be a roof way up in the sky that similarly holds back the rain. And just like holes in your house’s roof lets in rain, so do holes (and gates) let in the rain beyond the firmament. Pretty logical thinking, that. The authors of Genesis, according to Pannenberg, used the best science of their day and interpreted it as God’s work. Taking the text seriously, then, means doing the same. It would be wrong to stick with ancient science and cosmology, because it would go against the spirit of the original text. If we want to honour the spirit of Genesis, we must take the best science of our day and interpret it as God’s work. That’s why those who want to take Genesis and the Bible seriously must reject creationism and embrace evolution. Because evolution is the best science of our time. As far as we know, based on empirical observations, evolution is an accurate description of the great biological diversity we see in the world. Creationism is not. Creationism is, according to this logic, unbiblical, even as it purports to take the Bible seriously. The problem is that it doesn’t take the Bible seriously enough. Taking the Bible seriously – taking it literally even – means aligning with the spirit of its texts. In the case of Genesis, that means taking science seriously. And taking science seriously means accepting the veracity of evolution.